Question: What is the role of the external part with regard to the internal part? Answer: The external part is meant to put pressure on the internal part. This is actually what builds the mutual connection between Galgalta ve Eynaim and AHP. Galgalta ve Eynaim are vessels of bestowal and they don’t want anything for themselves. They have no needs if it isn’t for bestowing unto someone below them. Their state with regard to the Creator is called Hafetz Hesed and they are incapable of more. It says, “the fewest of all the nations.” What is more, this doesn’t refer to quantity, not to the 15 million representatives of the Israeli nation in the world, but to the fact that we don’t have a strong enough desire. This is the reason that Israel are few and cannot advance. I simply don’t want to ascend; I don’t feel any need for that. Even if I do feel the need to do so, it is only when I have a reason to or someone to do it for, and if I have the means to do so. The Israeli nation cannot do anything by itself. This is the reason that the pressure of the nations of the world is necessary. Moreover, it has to be great, in the form of the pressure of seven billion on 15 million. We need this Aviut (thickness) of the desire because it will force us to raise the ultimate request, MAN, and to bring everyone to the end of correction. We will not be able to overcome otherwise. We are unable to want more for ourselves and even the study doesn’t turn us into Galgalta ve Eynaim. We format the complete vessels of Galgalta ve Eynaim in order to help AHP, but if I don’t set it as a goal from the beginning, I will not even be given the state of Hafetz Hesed. This is the reason that Galgalta ve Eynaim doesn’t grow without AHP. Therefore, the wide dissemination we do, during which we meet the desires of the AHP, and it makes no difference which desires, will push us to connect and to unite. We already know that from our earlier experience. Nothing is more helpful than troubles, but instead of waiting for real troubles, we absorb the troubles and problems of others. What Are The Nations That Populate Me? Baal HaSulam, “Introduction to The Book of Zohar,” Item 66: Bear in mind that in everything there is internality and externality. In the world in general, Israel, the descendants of Abraham, Isaac, and Jacob, are considered the internality of the world, and the seventy nations are considered the externality of the world. Also, there is internality within Israel themselves, which are the wholehearted workers of the Creator, and there is externality—those who do not devote themselves to the work of the Creator. Abraham is the right line of the spiritual development and Isaac is the left line. They reach a state of the middle line, Jacob, and then they even reach a level of greatness called Israel. At the end, they are already arranged in the direction of Yashar-El (straight to the Creator). All the desires that are not arranged according to the three lines, in smallness and in greatness (Jacob and Israel) are called the nations of the world. This is the total desire that was created and this is how it is divided into two parts. Later every level is divided into two parts: Galgalta ve Eynaim and AHP. 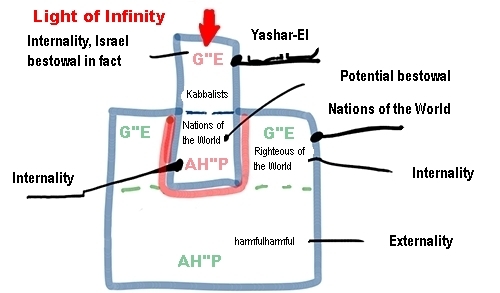 Accordingly the upper internal part is called Israel and the lower external part is called the nations of the world. Thus, there is a certain ratio between them. Israel receive the awakening, the urge that leads straight to the Creator, while the nations of the world don’t receive the urge to reveal the Creator and to be incorporated in Him and adhere to Him yet. AHP and Galgalta ve Eynaim are in the same ten Sefirot, but lower desires cannot work with the intention of in order to bestow and to be called Israel yet. They are under a restriction, but they are not the nations of the world anymore, which means that they don’t yearn for different things, they want to enjoy in different ways anymore. No, they prefer to be under a restriction and are therefore called foreigners. This is the term for the average between the nations of the world and Israel. The desires of the phase of Israel are aimed straight at the Creator. They are already restricted and have a Masach (screen) and the Returning Light (Ohr Hozer), and they work with the intention of in order to bestow. On the other hand, the desires of the phase of the nations of the world are a vessel (Kli) that are not corrected yet, and that still have an Aviut (thickness), that have not been restricted and has no Masach or the Returning Light. There are desires that are in the middle “proselytes,” which are already restricted but cannot bestow yet. These three types of vessels can be in the same person: sometimes the vessel in which you want to bestow is revealed in you; sometimes you cannot bestow but you don’t want to receive, and sometimes you don’t care about bestowal and you only want to receive. These vessels are not revealed all at the same time. Suppose you want to eat and sleep, what do you prefer? To eat and then to sleep? It turns out that one comes before the other and there cannot be two desires at the same time, although they may both be in the right direction. There is always one whole desire. This means that everything in the world and this whole world is divided into two parts: into internality and externality. This system includes all of humanity and is divided into smaller and smaller elements, which are of the exact same composition, as all the parts are always in the same ratio according to the same principle. The phase of Israel in a person is connected to the light of Infinity and is therefore important. Opinion (Dr Dan Schueftan, head of National Security Research Center – Haifa University): “We should only deal with managing the conflict which means to continuously engage in improving their life, but this is management and not an attempt to resolve the conflict. The root of the unique problem of the Israeli society is the fact that the Arabs are a minority in our state, but a minority that feels that it is the majority because it is the majority in the Middle East. The Jews, on the other hand, are the majority in this state but they have a strong feeling that they are a minority. “The global situation affects the Arabs and they feel that they are part of the big Arab world. If the global Arab society tries to solve its structural problems and turns to barbarism, part of the Israeli Arabs also show their interest in these ideas. It is actually this paradox of consciousness of the Israeli Arabs that leads to the conflict and the confrontations which cannot actually be resolved. Any attempt to solve this conflict only worsens the situation and threatens the existence of the state of Israel. “The point is that Israel appears to be a colonial enterprise, but the attempts to change it according to western models may destroy its foundations. The peace agreement of ‘two states for two nations’ actually leads to the creation of two states: a western one and one that is not Jewish, gradually turning the state of Israel into an Arab state. “The Israeli Arabs have never seen themselves as Israelis and they don’t want to see themselves as such, but they wish neither to leave “evil” Israel nor join the ‘wonderful’ Palestinian state that will sometime be founded.. They want to live in Israel, but not accept it as their state. This is typical of the Middle East. The Arab society has realized that it will not be able to come close to western society in its standard of living. It is actually drawing further away from it and will not be any better in the future as the process of destruction in the Middle East continues. “What stands in the way of the Middle Eastern states catching up with the western states is the intolerance and the reluctance to accept others. If a person treats his wife like an object, you can invest as much money as you wish, but it will never be a western society, and science and a western lifestyle will never be developed. Only those who exhibit extreme attitudes can count on the support of the masses. “Arab immigrants in European countries and in the US develop their own self image, thus preserving from what they have escaped. The Americans stubbornly believe that democratic principles will be accepted by both the Arab immigrants and the Middle East; that everything will change for the better and everyone will live by western standards. But the genie is bursting out of the bottle destroying everything around it and things are getting worse and worse. The only saving of the west and of America is a change of attitude regarding the Arab problem. My Comment: The wisdom of Kabbalah sees this problem as given to us from Above so that we will develop spiritually. And, I see the same solution: only Israel can save western civilization! Question: I am an education student. You say that education is the only way to correct the current situation, but education is a long process that takes years. What is more, I am trying to do something in my local environment and I see that not only does it not improve the situation but it actually make things worse. What would you recommend now in light of what is going on lately in Israel? Answer: Our problem is that we develop in a way that we seem to be the horse chasing the cart. We advance by impulses that nature summons within us. We change and then we see how evil we become in our new state and what we can do in order to become a little better. Thus we always try to improve yesterday’s state, never today’s state, and certainly not that of tomorrow. This is the reason that our education system is ineffective, and as you say, “education is a long process.” If we bring up our children incorrectly now, we will only see that we were wrong in 20 to 30 years. You are right, this is a problem! Therefore, even great experts in the field of education cannot provide the educational system that is right for the generation growing up today and which will run the world in 30 years so that they will have this method and be able to use it correctly. We cannot come up with such a method by using our own minds! After all, we have not developed to the state in which we can develop the education system nor teach it to everyone so that we will be properly educated in the future either. We don’t know where nature will lead us in 30 years, but the educational system has to be corrected now in order to fill, correct, and complement all the differences and contradictions between us, as well as all the states that will be revealed in the future. We cannot even imagine what a person, an Israeli citizen, will be like in another 30 years. This is the reason that I understand your question. You are right that the current educational approach is unsuccessful and that it cannot be. Only a person from the future can provide us with the right method, which means someone who knows the state into which we should develop. Therefore, this person already precedes his time and provides us with an educational system so that we will be ready for the future, although we haven’t yet reached it and haven’t yet developed internally for it. This is the reason that we need the wisdom of Kabbalah that teaches us about us and explains the whole process of our evolution, to what state we reach at any given moment in our history, and how we should unite so that we will be ready, not only today or tomorrow, but also for the day after tomorrow and always. It is because this method is eternal and ready for any and everyone. Therefore, the educational system has to stem from the true sources of the wisdom of Kabbalah. It doesn’t mean that we actually need to study this wisdom, but this system stems from it, from the deep understanding of man’s nature and his environment. The Torah, “Numbers” 11:5: We remember the fish that we ate in Egypt free of charge, the cucumbers, the watermelons, the leeks, the onions, and the garlic. Question: Why did the memory of what they ate in Egypt suddenly come up? The desires of the “mixed multitude” obligate a person to examine if he is carrying out the Mitzvot (commandments) of this world correctly. They call upon him to maintain the Torah with the help of physical actions, rather than correcting his soul, his relationships with others. Who Determines The Taste Of The Bread From Heaven (Manna)? Would You Like Some “Manna From Heaven”? Question: Today, there are internal conflicts that are tearing Europe apart. How can we prevent the growth of hatred between the different sectors when we are working on union? Answer: Integral Education will tangibly show people that there is no other way out. They are entering into a program possessing a global character to begin with, which clearly determines the future horizon—the union of the whole world. After all, it is inevitable; the laws of nature obligate us to this. From year to year our development approaches general union more and more, in spite of the bloody attempts to stop this process, which in spite of it all is strict and continuous, no matter how much we may deny it. – World war using the most up to date means of mass destruction, which will be a death sentence for Europe. – Salvation by means of balance with nature, which reveals itself as global, integral, unified, coherent, and balanced. This means that human society, and the Europeans in particular, must also achieve this. So let’s begin. This is the choice of Europe and humanity. Question: We are truly powerless against the laws of nature. I may disagree strongly with the aging of the body, but the body will age in spite of it all. What is the law that operates at the level of human development in general? And how does it come to be expressed today in the European Union? Answer: According to this law, all of us will “roll” into cohesion, union, and oneness. This is like a mixture of various fruits in a blender. At first it is still possible to distinguish between them, yet the blades continue to spin and the differences gradually disappear until a uniform “fruit pulp” is created. And so it is possible to reach this union in a good, wonderful way, without wars, disasters and terrible spins in the “historical blender.” The general trend is that there is only one culture, the knowledge of which we are carrying. So let’s conduct connection workshops in families, in workplaces, in schools, in prisons, everywhere. Let’s teach people to connect. And since modern separation has already gone as far as it will go, let’s insert a component of requiring this common program. However, it is important to work gradually here. Start with small groups, after that larger groups, cities, regions… gradually, every people will make an arrangement for themselves, and after that, the nations will also be able to find a common language in the context of international connection—European and global. That is how the process operates, from small to large. Gradually we gather experience, build the required mechanisms and systems, organizing educators, teachers, guides, trainers, instructors, and other experts. After all, in any case, nature will transform us into “pulp.” Until now this happened under very unpleasant pressure from its side, through wars, disasters, epidemics, and the like. At present, we can integrate ourselves within the general “pulp,” aware of the situation and direction of inevitable development. Question: What is the technology for preparing this friendly “pulp” from individualists and egoists? Answer: Education, explanation, presentation of the facts testifying that there is no other way. Question: But what will connect between people? What will be the glue between them? After all, the blender just cuts up the ingredients. Answer: We produce the power that connects between us through the efforts themselves, our efforts in consolidation. This force is also latent in nature; this is a global force. One only needs to activate it. If we begin to build balance between us, taking steps towards union, then we awaken and produce the natural force of union. This force is integrated into the system; it is found in inanimate, vegetative, and animate nature, but we awaken it on our level so that it will operate among us, within us. Question: Basically, what is this force of union? Answer: What is it that connects the parts of the whole? What welds the parts of matter with one another? What is the force of gravity that attracts objects towards the center of the earth? We discover it according to what it does. That is also how the power of union, the “human force of gravity” works, when we truly yearn to be consolidated. Then it will help us. We sit together, not even with any particular desire, and we begin to converse, to discuss the ways of reaching union; we begin to do something together in this way and then gradually we truly connect, enter into a welding between us, understand more, feel each other more. Question: Why doesn’t this force help the European Union unite? Answer: It is because from the start the European Union didn’t place before itself the right goal. In fact, its goal was a banking and industrial union for the sake of profit. But we are talking about a completely different kind of profit—educational, human profit, the advantage of having a single heart with the universal nature that is absolutely completely integral. Its uniting force doesn’t act by itself in every case; rather it acts only according to our efforts, intentions and goals. Specifically we human beings are capable of activating it. Along with this, we don’t have the power of union, but we have only the power of separation . Nature is welded and whole, yet human society is in contrast to that: We reject and hate each other; we are not interested in reaching balance. This is human nature and it is up to us to correct it. We correct it by means of the first steps in consolidation that awaken the power of union, and it will take care of us and give us the ability to truly connect.